The holiday season is officially here, which means Old Man Winter is just around the corner! While we’re still winding down the days of autumn, and the temperature may feel like we’re in a full blown winter, you still have some time to get your winter decor ready! For starters, we have a great DIY project for winter wallpaper that we know you’re going to love! 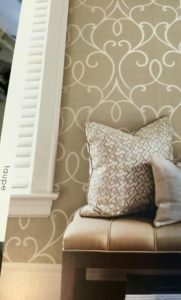 Wallpaper is definitely making a comeback, and with advancements in installation and the wide variety of options now, you’re going to love what you see. We’re a little biased though — we’ve never found a wallpaper we didn’t like and have yet to get tired of a really well done grass cloth! 🙂 However, there is one thing we must fess up to: we hate a wallpaper border and are really hoping THEY don’t make a comeback! If you’re in the market for a variety of wallpaper books, check out Sherwin Williams. They have a great variety of wallpaper books you can check out right in store and even coordinate with paint samples while you’re there! Measure the length and height of each wall. 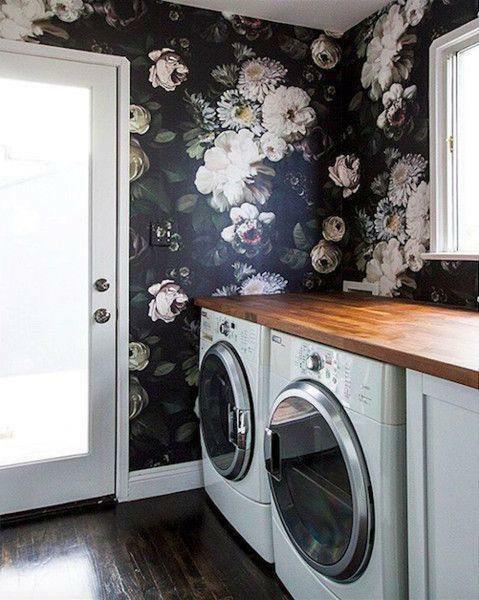 We’re pretty sure this is a “must” for obvious reasons, but you want to make sure you have enough wallpaper to cover the wall! Don’t forget to subtract doorways and large windows. You won’t be covering the entire wall in wallpaper, you’ll be cutting out the doors and windows that may be on the wall so don’t forget to account for that. Our recommendation is to round the length measurement up to the nearest half-food or foot to make it easier to calculate how much you’ll need. Be sure to multiply the length and width of each wall to get the area in square feet. If you’re wallpapering an entire room, you’ll want to get these measurements for each wall and then add them up to get the total area of the room. This will help you to guarantee you buy enough to cover all the walls in the room. Don’t forget about waste! You’ll want to up your measurements by about 15% to make up for waste. You’re probably going to make a mistake or two, and will want to save yourself a trip back to the store by knowing you’ll have some waste ahead of time. And to help you out a little: a single roll of wallpaper will cover about 36-square-feet! Use these tips to help make your winter wallpaper project a little easier, and don’t forget to show us your project “afters!” We can’t wait to see them! Don’t forget — while you’re out searching for new home decor to fill your room, be sure to stop by A Village Gift Shop at 3 Village Square in Glendale to pick up what you need! Visit www.avillagegift.com or call 513-771-3927 for more information!